The Spitzer Infrared Nearby Galaxy Survey is a comprehensive survey of 75 galaxies selected within 30Mpc. In addition to 3.6-160μm imaging and 5-40μm resolved spectroscopy of the nucleus and selected extra-nuclear targets, SINGS is providing a coordinated sample for intensive multi-wavelength study, which includes Chandra X-Ray, Galex and UIT UV, optical BVRI, H-α, and drift-scan spectroscopy, NIR JKH and HST Paschen-α imaging, MIR Spitzer imaging and resolved spectroscopy, SCUBA sub-mm, CO, BIMA SONG radio continuum, and VLA HI maps. In the logo at right, the SINGS galaxy M51 is shown in IRAC Spitzer bands from 3.6-8.0μm, with spectral mapping strip overlayed in blue. More information on SINGS is available at the team website. I am involved with the spectroscopic component of SINGS, in particular the spatially resolved mid-infrared spectral mapping of the nuclei and selected extranuclear regions with Spitzer's IRS Spectrograph. A collection of Reach-model backgrounds for observed SINGS targets. Maps of requested and reconstructed pointing positions for all SINGS IRS observations. A short write-up on extended source flux calibration issues with the IRS. NGC 7331 ApJS Special Issue working paper page. The full internal SINGS directory. 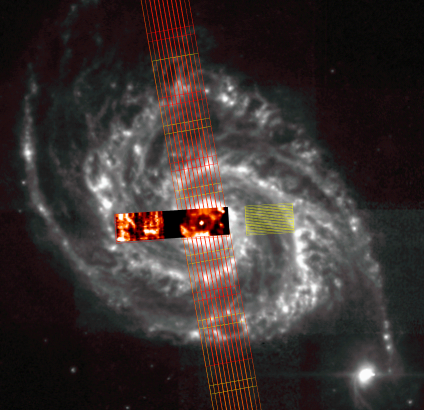 The Spitzer component of SINGS makes heavy use of spectral mapping mode, in which large areas are mapped by rastering the slits of Spitzer's IRS spectrograph around regions centered on the nucleus, and selected extra-nuclear targets. At left, the M51 8μm image is overlayed with maps created from the IRS spectral mapping data set. The PAH 7.7, 11.3 & 12.7μm map of the nucleus is in red; mouse-over the image to view a 25μm continuum map along a radial strip in blue. Cubism is a tool created to assemble and analyze spectral cubes from spectral mapping data sets. The 5-40μm range which Spitzer spectroscopy probes is extremely rich in nebular, photo-dissociation region and molecular hydrogen lines. We are exploring a variety of diagnostics which take advantage of the spatially resolved spectro-imaging used throughout the SINGS program. 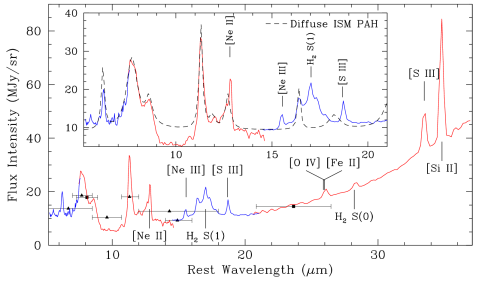 The spectral mapping dataset is ideal for tracking variations in the ubiquitous mid-infrared polycyclic aromatic hydrocarbon (PAH) features, which can contribute up to 20% of the total infrared luminosity of star-forming galaxies. A new feature at 17.1μm, discovered in SINGS galaxy NGC 7331, is currently being investigated, and can be seen in the composite low-resolution spectrum of the inner kpc at right. This strong feature (up to 50% the luminosity of the 11.3μm feature) is also found in the Galactic reflection nebula NGC 7023. A comprehensive tool for decomposing the MIR spectra of galaxies and other objects is available in PAHFIT.